Even though I can be critical of a lot of BET's programming, one thing that I'm never ever critical of them for is the annual airing of the Black Girls Rock! showcase as it lovingly celebrates and honors the achievements of black women in entertainment, education, and philanthropy. As its in its fifth year, the show is getting even better, and this year it didn't fail to uplift and champion the importance of Black women and their existence. Though some may try to derail that motivating spirit (and lordy, they do...) the vision that creator Beverly Bond put forth some odd years ago remains intact and even more empowering than ever as the show continues to resonates with so many who just want to see Black women do the damn thing. 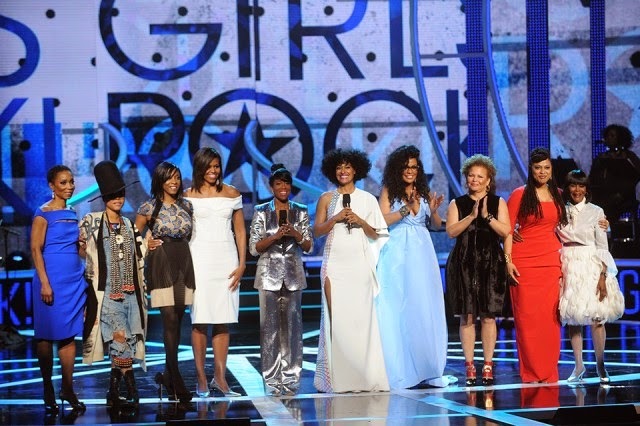 Hosted by the fabulous duo of Tracee Ellis-Ross and Regina King, this year's Black Girls Rock! featured an even wider variety of bold soul sistas with Cicely Tyson, Jada Pinkett-Smith, Ava DuVernay, Janelle Monae, and our lovely First Lady, Michelle Obama all making noted appearances. The musical performances also didn't disappoint with Sheila E., Erykah Badu, Jill Scott, Estelle, Ciara, Lalah Hathaway, Faith Evans, Fantasia, Kathy Sledge, Alicia Myers, and Cheryl Lynn (whew!) all taking to the stage to celebrate the sisterhood through song, reminding us all why Black girls do indeed rock. Grand dame percussionist Sheila E. opened the show with an electric performance of her classic hit, "The Glamorous Life" (aka one of my all-time favorite songs). She then topped the performance off with a highly energetic drum solo taking things to a fantastic natural high. I actually wanted that performance to go on for longer! Estelle brought fire and empowerment with the Jussie Smollett-less version of her single, "Conqueror". Actually I like the song fine without Smollett, and find it to be one of Estelle's best. Lalah Hathaway, Faith Evans, and Fantasia made sure to exemplify Black lives mattered as they sung their rumps off through a searing medley of inspirational cuts with Hathaway covering her father's classic, "Someday We'll All Be Free", Evans flipping the gender scrip with J. Cole's tribute to Michael Brown and Eric Garner on "Be Free", and Fantasia closing things out as she cried and carried everybody onward to church with "Mary Don't You Weep". It was the ultimate treat to see some underrated disco divas of yore get some shine, and Cheryl Lynn, Alicia Myers, and Kathy Sledge all made me smile as they covered their prospective classics, and closed out the evening by joining forces on the appropriate note with an illuminating version of "We Are Family". You can view all the performances from 2015's Black Girls Rock! on this handy playlist!